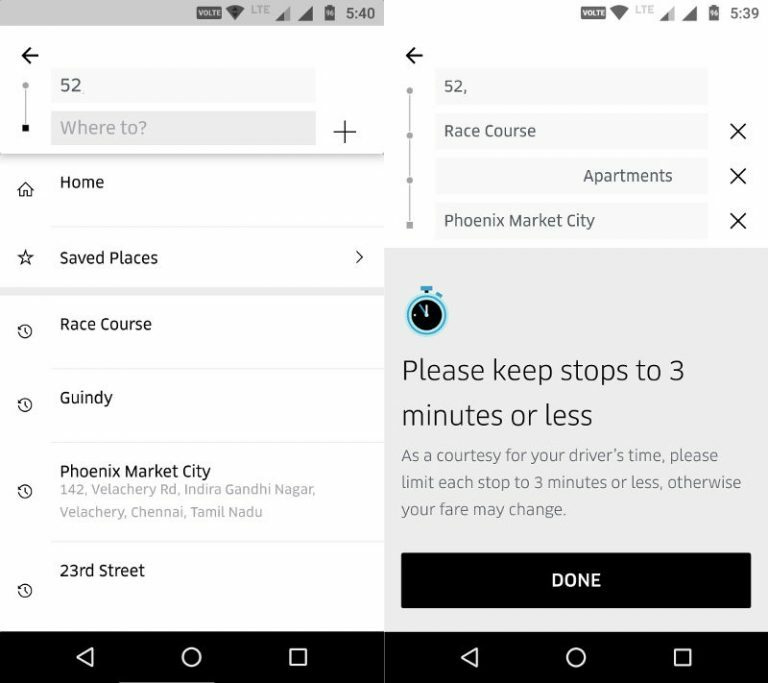 Popular cab hailing service Uber has launched a new feature that lets users in India add extra stops during their rides. The feature is quite useful to pick up and drop off people anytime during your ride, if you are travelling with friends. Users can add up to 3 stops in India and the fares will automatically include time and distance rates on trips with multiple stops. Uber had already introduced this multi-destination feature in several countries earlier. This will let riders add multiple stops along their route. To use this feature just a few taps in the app when booking a ride are required. To use the multiple stops feature, open the Uber app and tap the “Where To?” box. After that tap the “+” to the right of the box. Now you can tap on “Add a Stop” and add your addresses and destinations and then request your ride. You can also add any other stop at any point during your ride as well. You have to tap “Add a Stop” again and Tap “Save” if you wish to add more stops. It is to be noted that you can only add 3 extra stops in the whole journey. Uber says that each stop should be taken maximum for 3 minutes, otherwise fare may change to include additional time you spend waiting at each stop. Any new stops added during a trip will instantly update the driver’s route and it will show up on your app. Once customers reach one of the added destinations, they need to swipe ‘confirm stop’ to get routed to the next location. Recently, Uber has also introduced UberHire XL in Delhi NCR. The UberHire XL is similar to its earlier introduced UberHire where you can hire a cab for your whole journey. Now, this Hire XL will enable up to 6 riders and they can hire 6-seater SUVs to travel instead of 4 riders in UberHire.